Good news, WoW junkies - you're about to get a whole lot of Cataclysm information very, very soon. It may be a bit later than originally anticipated, but the closed beta test for Cataclysm, the third expansion to mega-MMOG World of Warcraft, is officially under way. According to Blizzard, invitations to the beta are now going out to "a wide range of players from around the world who signed up" via the opt-in. 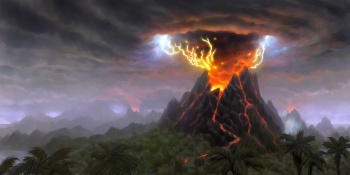 "Our focus with Cataclysm has been to build on the knowledge we've gained through the previous expansions to deliver the best, most compelling World of Warcraft content for our players to date," said Blizzard CEO and cofounder Mike Morhaime. "Gathering focused feedback during the beta test will go a long way in helping us reach that goal when we launch Cataclysm later this year." Oh, by the way, this means that any and all NDAs are officially up. So you'll probably be seeing lots of Cataclysm information in the next few days - especially here. ... I guess you'll just have to come back and find out, won't you? The Mage They Call Jayne(z) will ride again! On a flying mount! In old-world Azeroth!